The sun has been shining here in the UK which makes such a difference! I decided to paint my nails using my favourite nail polish Lavender Love and Bluebell which comes free with this months InStyle magazine. 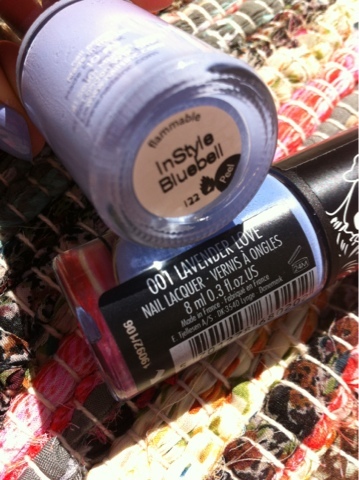 I've been tweeting about both these shades and once I heard Bluebell was a close second to Lavender Love I just had to get my hands on it! I was hoping this was going to be my closest match to Lavender Love but sadly nope *sad face* whilst I think it's still very similar it's not a great match. 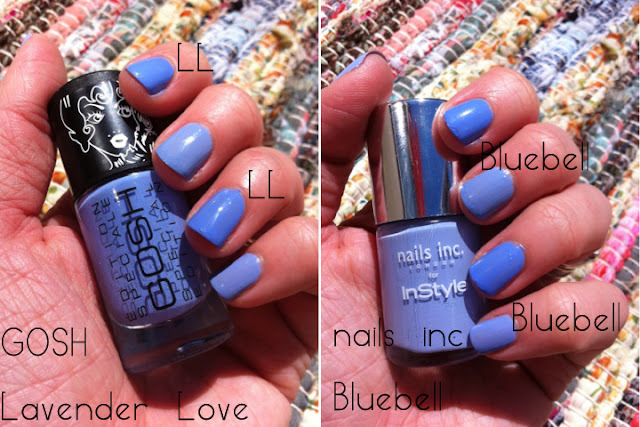 Bluebell is little softer and paler in tone where as Lavender Love is a creamier richer shade. They work fab together, I decided to paint them both alternate nails, I'm going to go for a 'Rainbow' look next when I need to take these off. I've seen a few posts using a few different pastel shades and think they look so cool! What do you have on your nails?? I saw this on the Instyle magazine last week but didn't pick it up as I thought it was too similar to a polish I already had... it actually isn't so I really wish I had bought it as it is gorgeous!